Set aside 2 minutes to sign up! You can do it! Forget freaking out about whether you can vote or not on time--YOU CAN! It's not too late to make sure you are signed up correctly! If you made a mistake in signing up or want to make sure you are still signed up, there's still time to fix it. 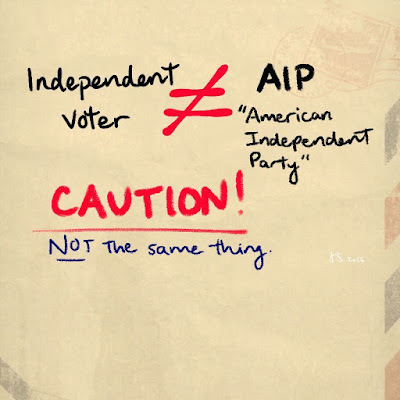 What to look out for when you sign up to vote: Being independent is NOT the same thing as signing up as American Independent. Almost half a million people made this mistake, and it's totally understandable since the name is misleading and they don't provide any info on what each party is when they ask you about your preference. 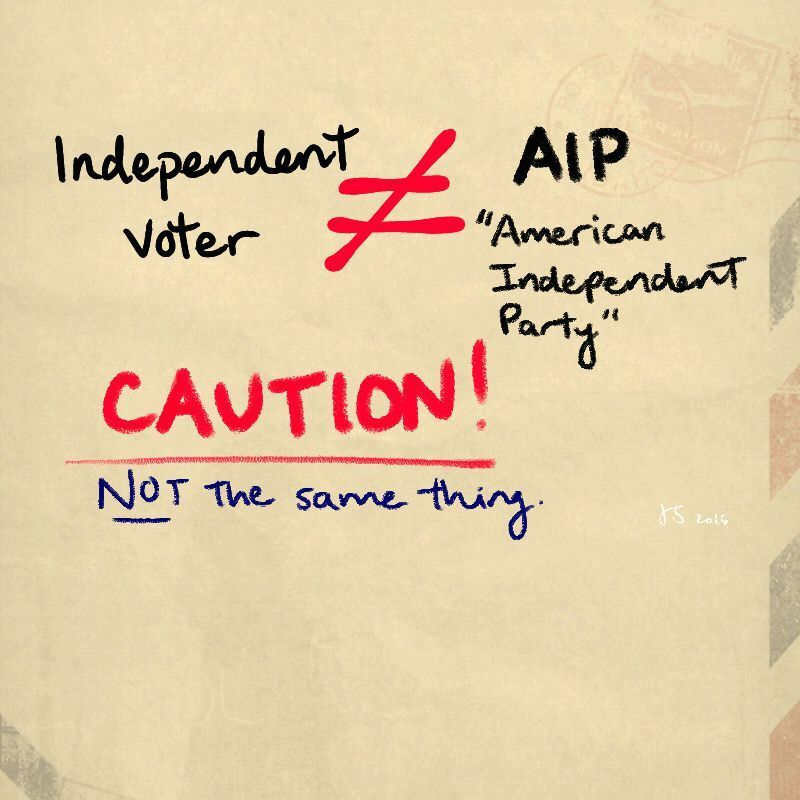 If you want to be Independent, DON'T mark American Independent! It's not the same. 1. YOU CAN STILL SIGN UP TO VOTE IN CALIFORNIA BY MAY 23rd. Don't put it off! The only way to guarantee you can vote in time is to do it way before May 23rd. DO IT NOW HERE! 2. 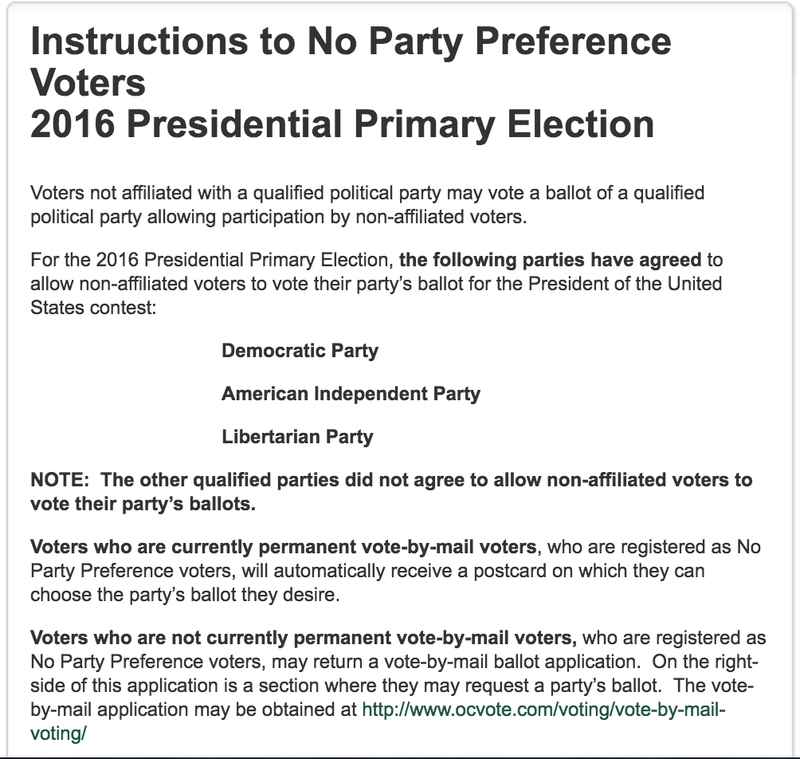 IMPORTANT: If you want to vote for one of the Democratic candidates, you MUST register as either Democrat OR independent. If you want to vote for one of the Republican candidates, you can ONLY be registered as Republican. 3. Check to see what you are registered as HERE. Click to make sure your status will let you vote how you want to! 4. To guarantee your vote, apply to vote by mail NOW. When you check your voter status, it will tell you what party you are with or if you are independent. From here, you can click "Apply for a vote-by-mail ballot"
When you click to vote by mail, you can select what party you want to vote for. You also have a choice of being able to vote for the far right, "American Independent" if you so choose. But caution with this and do not confused AI with being independent as almost half a million people have understandably done. 5. No excuses! California makes it easy to sign up to vote by letting you do it ONLINE HERE. Only the Primary Presidential election in California is closed. 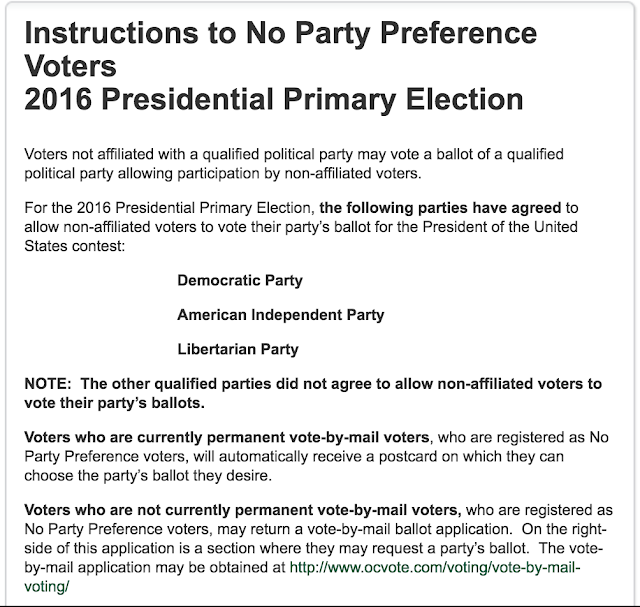 So you have to be either "decline to state" to be considered an independent voter or Democrat in order to vote for either Senator Sanders or Secretary Clinton in 2016, or you have to be marked Republican in order to vote for Governor John Kasich, Senator Ted Cruz, or Donald Trump. After the June 7th election (you must register by May 23rd), you can switch your political party back if you want because all other elections will let you vote for any candidate running. Use the same process to switch your political party affiliation. When you need to do what by. Pretty much, sign up ASAP. If you're not a permanent vote-by-mail (it'll say on your status), log back in to request the Democrat ballot (assuming that's what you want) ASAP, & when you get it, fill it out, sign it, and mail it back ASAP. And that's all, folks! SIGN UP and wait for them to mail you your ballot, if you are a permanent vote-by-mailer. If you just signed up to vote by mail and it doesn't say you are permanent on your status, then log back in to request the ballot you want ASAP! Make your choices, don't forget to sign, and mail it back ASAP to get it in on time! If you forget to sign, fear not, there's a way to make sure your vote is counted. For example, Orange County has this. But just remember to sign and you should be fine!